As to underline the sacredness of their own Holy Trinity, Foals’ new record in not only titled “Holy Fire” but it encompasses with never heard before bursts of energy a new-found way to express their often hard to grasp music, producing a work that stands a step above 2008 “Antidote” and 2010 “Total Life Forever” only for its complete and coherent feel. Leader and vocalist Yannis Philippakis, whose previous inspiration was to be found in futurology and the theory of singularity, is now stating what everybody else were thinking,”There was a Woody Allen in our brain that needed to be killed. He got killed with Holy Fire”. The cover of the album, a photograph by Thomas Nebbia, finds its context in the opening track, a “Prelude” that makes you wonder where that horse standing on the beach is heading and where Foals are going to take us with this journey. The first few instrumental minutes not only serve to set the mood but most importantly they clearly show that this is not an ethereal and religious odyssey. It comes from their “tropical prog” sonorities to shift with slightly aggressive drums and guitars into a ticking bomb that is about to explode. Singles “Inhaler” and “My Number” really start off the record and the latter one, a question mark at first when it debuted on the UK TV for its pop-ish direction, somehow fits in this holy trinity because it displays an element that even the wisest have to master: don’t take yourself too seriously. There is no need to panic on one track, it is true that Foals are aiming to a more carefree approach but already with “Inhaler” this feeling is to be found in the lyrics alone where everything is a “make believe” while the haunting crescendo of the rhythm blossoms in a more familiar and exciting dance-punk and math-rock. It is time to get into the heart of the matter and we are led to an atmosphere that is reminiscent of their massive hit “Spanish Sahara” and of what really enchants us when thinking of Foals, that endless labyrinth where each melody wanders and get lost just like the listeners. Since they have no intention to substitute or to imitate the hit from “Total Life Forever”, they avoid the cliché and the evocative line “stay with me” of future single “Late Night” goes along with the first sort of invocation of a Greek muse. Yannis, Greek from his father’s side, sings “Oh Mama” here, “Oh Lord” in “Providence” and “Oh Mary” in “Bad Habit”. You can’t help but wonder if this might be his own personal holy trinity. The holiest of the holiest is revealed in “Milk And Black Spiders”, a sublime track that would visually make a wonderful video on the loop “cause I’ve been around two times and found that you’re the only thing I need”. All the new possibilities on this new record through synthesizers and drum machines that they haven’t used before, establish their foundation in this surrealistically titled and romantic track, “cause I know you’re still with me, You my compass and my sea”. The closing triptych of songs features “Providence” with its blasting finale on the “I’m an animal, just like you” repetitions that implode into “Stepson” and its quintessentially Foals’ dark melancholia where this sense of inevitability, “Step out, aching stepson. And you’ve fallen to the blue” unfolds through this as precise as a lullaby melody. Inspired by the opening shots of “Melancholia” by Lars Von Trier, “Moon” sounds like a ritual and feels like a cinematic experience for its lyrics, depicting a world that is collapsing under the silent stillness of the moon, are nothing short than a little piece of poetry. It feels like a sinister ending but “it is perfect, it is beautiful and still. And it is silent, it is white and it is good”, and just like the moon controls the tides, this songs controls the beach scenario of the opening track as if to wash away shame and guilt to accept for a little moment that our fate is ineluctable. You may need to listen to “Holy Trinity” more than once to get used to this new phase of Foals but in the end you will realize that their full identity is there, eventually, just like a full moon each month. They may have killed Woody Allen, but Lars Von Trier is always lingering there. 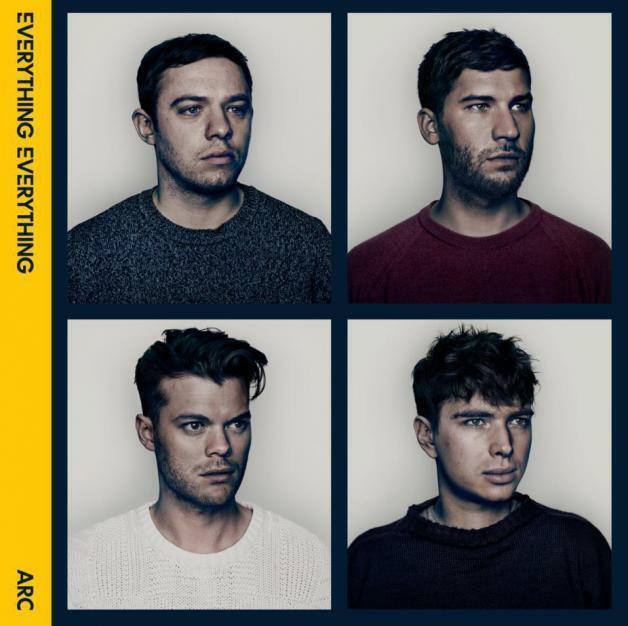 When British indie-pop-rock Everything Everything released their debut album back in 2010, frontman Jonathan Higgs explained their sound as “pop primarily but I think it’s a little bit more interesting, so I guess you’d say it’s unpredictable and sort of surprising”. They are familiar with the “surprise effect” since their beginning when first they made the longlist of the BBC Sound of 2010, a list created by Britain’s tastemakers who vote for their favourite new artists, then they had their “Man Alive” album shortlisted for the prestigious 2011 Mercury Prize. “Arc”, their second studio album, is set to surprise their fans as the word “pop” here is nothing like anything that may cross your mind right now. Getting to the core of this work is like removing layers of complexity and facing the fear of technophobia which is the theme of their songwriting. If “Man Alive” was a wonderful attempt to impress us with overwhelming multi variegated rhythms as to proclame themselves as innovators, “Arc” may kick off in a similar fashion with singles “Cough Cough” and “Kemosabe” but it turns soon enough into a more accesible and ethereal album thanks to the transcendental “Undrowned” and “The House is Dust”. In this work of transition the album title sounds like a premonition becoming real. They take their musical baggage on board of this metaphorical arc before the flood arrives and in these moments of reflection tracks like “Duet”, “Choice Mountain”, and “Armourland” show us a side of the band that can fall into a new art rock category, whether the “Arc” is filled with echoes of Radiohead and Sigur Rós or an intricate musical system that adds up to the indie genre. New Zealand has been one of first countries to witness the dawn of the much anticipated apocalyptic day that December 21st 2012 was supposed to be. 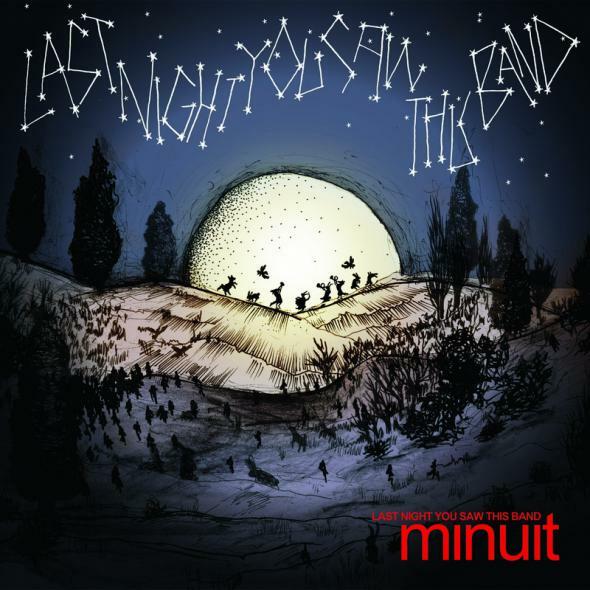 It was not the end of the world and for electronic band Minuit it was the perfect day to release their latest work “Last Night You Saw this Band”. Formed in Nelson and taking their name from the French word for midnight, lead singer Ruth Carr and machine players Paul Dodge and Ryan Beehre explore a more stripped-down sound with lots of percussive songs that enhance the feeling of a journey on a thin line between redemption and apocalyptic end. The first minutes welcome us in this far away world with rhythmic island beats, starting with the opening title track, about those moments when friends remind you what life is all about, all to the background of a surprisingly, mariachi-style house party. Leading single “Book of the Dead” is next and despite the spooky lyrics, it is a M.I.A joins a tribe dancing around a big fire sort of song. The temperature rises up to “Island” and as some pressure is released by now, the mood shifts with “What We Know”. Ruth’s voice seems to work better on more sinister and aggressive performances like “The Love That Won’t Shut Up” and the beautiful “Ghost” where this ritual under the stars gets haunting and almost frightening “You say stars align, ha! Can’t you see these stars are blind”. It reminds of the full moon and the stars on the artwork for the album’s cover and under this sky Minuit mix sinister with salvation, melting each track into a precise body of work. Along with the mandatory lo-ends, gypsy brass, swampy slide guitar, and even some kids from an orphanage in Haiti, this eclectic and colorful trio not only pays attention to details in their music and gets inspired by their unique nature and surrounding but they also team up with onepercentcollective.org as one-percent of the album sales will go to the Kenbe La Foundation in Haiti helping disadvantaged children.